Friday, June 29, 2018, Crimes Against Children Investigators met with the Deputy District Attorney to review this case. Subsequently, the District Attorney’s Office filed 12 felony counts; six counts of Willful Cruelty to a Child and six counts of Inflict Great Bodily Injury on a Child under five years of age. An arrest warrant was issued for Jason Wenker with a bail amount of $750,000. 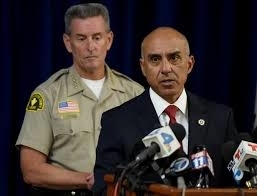 The Specialized Enforcement Detail of the San Bernardino County Sheriff Department, made contact with Wenker at a relative’s home in Perris and he was arrested without incident. Wenker is in custody at Central Detention Center and is expected to be arraigned on Monday, July 2, 2018 in San Bernardino Superior Court. SUMMARY: Monday, June 25, 2018, the victim was transported via ambulance from Beaver Medical Group in Redlands to Loma Linda University Medical Center (LLUMC) for a skull fracture. During a medical examination at LLUMC, forensic pediatricians found numerous other injuries to the victim, many of them in different stages of healing. All of the victim’s injuries were consistent with suspected child abuse. The victim is currently hospitalized in the Intensive Care Unit. Investigators determined the three-month-old victim resides in Loma Linda with her father, Jason Wenker. Following an extensive investigation and collaboration with Forensic Pediatricians from LLUMC, Wenker was arrested on June 26, 2018. He was booked at Central Detention Center for Willful Cruelty to a Child and bail was set for $100,000. Tuesday, June 26, 2018, Wenker posted bail and was released pending future court proceedings. Deputy Brian Arias (909) 387-3615. The Specialized Enforcement Division is comprised of specially trained and highly dedicated sworn and professional personnel who cover a range of specific enforcement areas. Personnel are organized into several teams and task forces to provide enforcement in disciplines requiring training and equipment not available to patrol deputies. The division is called upon for many elevated risk tasks such as S.W.A.T. responses, investigation of suspected explosives, elevated and high-risk warrant services, and apprehension of armed fugitives. Employees assigned to the Specialized Enforcement Division work as a cohesive unit to ensure the safety of the communities we serve.